This entry was posted in Weekly Photo Challenge and tagged Crafts, Crotchet, Photography, Postaday, Weekly Photo Challenge. Bookmark the permalink. My grandmother crocheted afghans of many colors. I think that she had mini-manic spells in the yard department of K-Mart, filling her basket with so many contrasting shades. 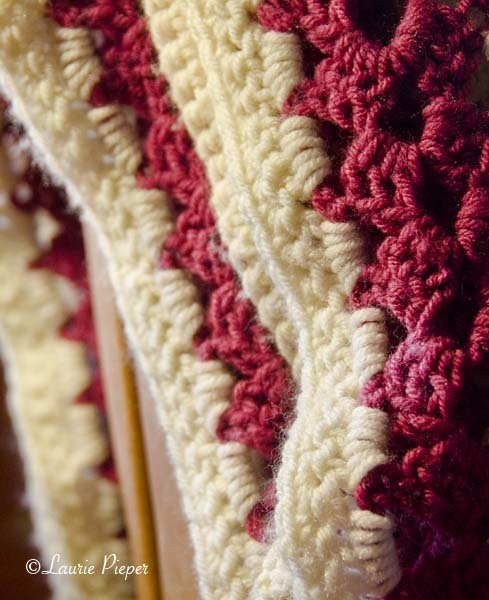 Near the end of her life, she crocheted a zig-zag pattern. Some were rainbows colors, others garden pastels, others Southwest-earthtones. Winter is coming. She died nearly 20 year ago. I can still cozy up to the afghans. Thank you for sharing your memories of your Grandmother, Oscar. I can picture her and her yarns.